The Minnesota Capitol in St. Paul, where the 134 seats in the state House are on the ballot this fall. A recent mailer from the DFL, the minority party, attempts to make an issue out of legislative pay. Political game-playing with legislators’ pay was something Minnesota voters had good reason to think they had ended two years ago. That’s when 76 percent of voters approved an amendment to the state Constitution that took control of legislative salaries away from legislators and gave it to a council appointed by the other two branches of government. Unfortunately — and to the discredit of the DFL Party — it’s back. That’s not true. The new constitutional amendment stripped legislators of that authority, giving it instead to the newly created Legislative Salary Council. That 16-member body is responsible for raising legislators’ annual pay in 2017 from $31,140 to $45,000 — their first pay raise since 1999. Legislators retain control over the legislative branch’s overall budget, though the governor can veto that budget — a fact confirmed with a messy court battle in 2017. The vote that marked the end of the veto fight last February set the 2018-19 budget for the Legislature at $32.4 million per year, the same sum that had been budgeted for fiscal 2017. It’s that vote that the DFL mailer cites — even though the House had no power to adjust the legislators’ salary amount in that budget. And even though 22 House DFLers voted for the $32.4 million amount in 2017 and two did so on Feb. 22, 2018. 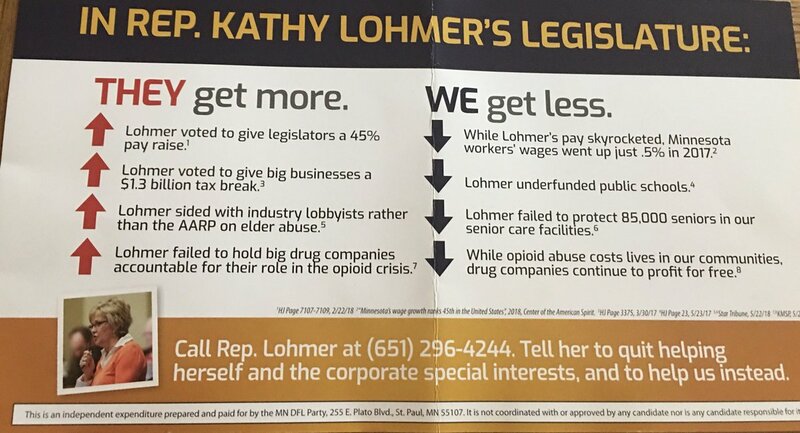 House Republicans are crying foul about the DFL mailer’s criticism for good reason. None of the Republicans who served in the 2013 House, which DFLers controlled, supported placing the pay council amendment on the 2016 ballot. Most 2017 Republican House members supported House Speaker Kurt Daudt’s stated intention to block the salary council’s pay increase — an intention Daudt finally abandoned in July 2017 under threat of a lawsuit. House DFL Minority Leader Melissa Hortman said the point of the mailers is that the pay raise for legislators went forward in 2018 while other pressing items on lawmaking agendas did not. Among the session’s failures she cited were efforts to tap pharmaceutical companies for the costs of combating opioid abuse, improve protection for vulnerable residents in senior care facilities, crack down on distracted driving and avert a pay cut for those who care for the disabled. Holding the GOP majority to account for those lawmaking lapses is fair political game. But the DFL mailers err when they pin responsibility for the 45 percent pay raise on Republican legislators. That charge is not only false: It flies in the face of a constitutional change that DFLers engineered. Voters in 2016 evidently agreed with the Editorial Board that legislators ought not set their own salaries. Now legislators should end their bad habit of playing politics with their own pay.